The very first thing that you must know when you take your first steps on this journey is that homeschooling is 100% legal in every state in the US. People in other parts of the world will have to investigate the legal situation where they live. Do, however, read on, for the general principles remain the same wherever you are. There are homeschoolers in every state of this country and, although laws vary enormously from one state to the next, it is possible for homeschoolers to create the kind of homeschool they want and still be within the law. However, one must be proactive: one must know the laws, and if the laws are restrictive, one needs to know how to creatively work within them. For instance, in Minnesota, homeschooled children, like public school children, are required to be tested by a licensed teacher in certain grades. If you contacted the principal of your local public school, he might just tell you (as has happened) that you need to come to the school and have your child administered a written test. But if you are well-informed, then you’ll find out that a) the test does not have to be written but can be administered verbally; b) that the teacher can come to your home; and c) that there are many homeschoolers in Minnesota who are ex-public school teachers who have kept their licenses current so that they can administer the tests to their fellow homeschoolers. So a law which can seem, on the surface, onerous and restrictive can, with a little creative and well-informed thought, be met with minimal disturbance. Here is a section from our Second Grade Syllabus on understanding the difference between requirements and recommendations. It is vital that you know your state laws well enough to be able to determine whether something is required by law or whether it is merely recommended. For example, if you are a homeschooler in New York you need to be deemed ‘competent’ to homeschool your child. Who is competent? “A person is deemed to be competent if they follow the regulations.” (Homeschool Legal Defense Association website). Who does the deeming? Presumably someone either in the local school superintendent’s office or at the Department of Education where New Yorkers must, each year, file an Individualized Home Instruction Plan. New Yorkers are also required to keep attendance records, write quarterly reports plus a description of the material covered in each subject and give each child a grade or narrative evaluation in each subject. Standardized testing is also required. Compare this with Wisconsin where no record keeping is required, there is no deeming of competence and no reports are expected. One just needs to sign and file a statement with the Department of Public Instruction each Fall swearing that one’s children are not truants. However… not every wannabe Big Man in every school district is conversant with his (or her) state’s regulations. Even here in the Free Republic of Wisconsin, local bureaucrats have been known to cause a lot of trouble for homeschoolers, even threatening to call social services to remove the children! This is why it is crucial that one understands the laws and have the support and wisdom of one’s fellow local homeschoolers. Back to looking at the differences of homeschooling in different states, one also needs to be aware of requirements and recommendations regarding course content. One first must be very clear as well about the difference between recommendations and requirements: do not confuse these! All states, including Wisconsin, have course content descriptions. 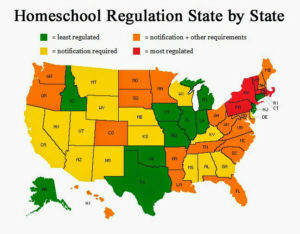 But Wisconsin, to keep with this example, does not have requirements (of homeschoolers, at least). The law in Wisconsin says homeschoolers “must provide a sequentially progressive curriculum of fundamental instruction in reading, language arts, math, social studies, science, and health”. But if you didn’t know this law and you went to the Wisconsin Department of Public Instruction’s website, you’d be confronted with a list of twenty subject areas, everything from Personal Finance to Agricultural Education, from Math to Theater, with great long descriptions of what is to be covered! And the DPI does not go to any great lengths to explain that these requirements are for teachers in public schools, not homeschoolers. For us, they are simply recommendations, to be considered or ignored as we see fit. Let’s return to New York. Here we do find course requirements. In New York all students from kindergarten through twelfth grade must study patriotism and citizenship, substance abuse, traffic safety and fire safety (I find that a fascinating selection!). In grades one through six, all children must study arithmetic, reading, spelling, writing, English, geography, US history, science, health, music, visual arts and physical education. Please note that the subject areas are what is required. From my research, it appears that there are no requirements (though there might be recommendations aplenty) as to exactly what one teaches or how much one teaches. If you are in a tricky state like New York, please find out for sure. We strongly recommend that you join a homeschool organization in your state: Ann Zeise maintains a list of regional and local support groups. Do be aware that many Christian homeschooling organizations have, as a requirement, a “statement of faith” for members to sign. You might do better with a secular or broad-based homeschooling organization. It is only because of the vigilance of homeschooling organizations that governmental interference in homeschooling is not more oppressive than it is. Here in Wisconsin, we have very fair homeschooling laws – due to the pressure exerted on the state legislature by homeschoolers, in particular, the Wisconsin Parents Association, and to their continued vigilance.